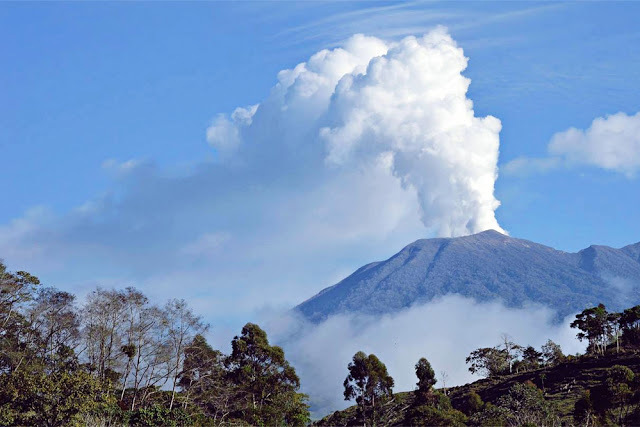 The activity at the Turrialba Volcano in Costa Rica just doesn't stop, on April 1st, two significant eruptions took place early in the morning and carried on for close to 30 minutes. The biggest eruption was registered at 8:38 a.m. local time and the cameras located near the crater registered a column of ash that reached between 500-700 meters above the active crater. The activity at the volcano started at 6:30 a.m. with ash columns of close to 300 meters above the crater. Seismic activity continues and a low amplitude tremor. Several communities in the Central Valley reported ash fall, among them, Hatillo, Curridabat, Coronado, Guadalupe, Moravia, Tibas and Heredia. Back in January this year the Turrialba Volcano became the third Costa Rican volcano to rumble back to life after a mag 7.8 quake hit neighbours Honduras.